Inlays and onlays are used to repair tooth decay on the chewing surfaces of your rear teeth (molars). They can also be used to repair teeth that don’t have enough damage to apply a crown. They are made from tooth-colored porcelain, composite resin or even gold and look very natural, so no one even knows they’re not your real teeth. They are also very strong and durable – necessary qualities for those busy back molars! 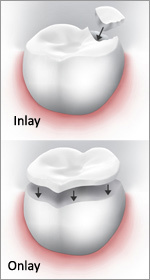 Inlays are custom-fitted to repair decay or damage in the ridges of the teeth. Onlays are also custom-fitted, and are used to repair decay and damage that occurs on more than one cusp (point) of the tooth. Each tooth has four points or cusps. Dr. Caramico can re-create the original anatomy of your tooth conservatively with CEREC in a single visit.